If you watch enough cooking or travel shows you start to make a huge list places you want to visit. Well for us Portland, Oregon is tops on our food adventures list. Portland has become famous for their burgeoning food scene which has simply exploded. It is often mentioned in the same sentences with top food destinations like New York, Miami and Las Angeles. Portland has become one of the premier food destinations for beer, coffee and our favorite food carts. Here are a few of the places we plan to stop at once we get a chance to make it to Portland. 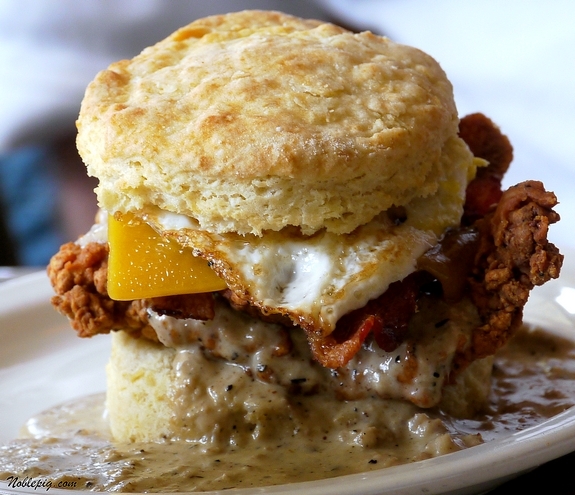 I think the photo above is a clear enough reason for why we want to visit Pine State Biscuits. We love Chicken Biscuits, and this one also has cheese, bacon and a fried egg with a sausage gravy, and is known as The Reggie. If you watch the video you will see how they make their southern style biscuits straight from North Carolina, as well as The Reggie. While it is certainly no where near healthy for you, it looks like one of the tastiest breakfast out there. We are almost positive it would probably solve any hangover. We hope to get to Pine State sometime this year and let you know just how good Pine State really is. We don't see anyway we could be disappointed (humm, I guess they could always be away on vacation when we go). Otto's has been open since 1929 in Portland. To this day they are still making hot dogs and sausages from scratch the same way they were when Otto's first opened. While we enjoy all types of hand crafted meat, we are dying to try one of Otto's hand made hot dogs. If you have been following our blog you will notice we really like our hot dogs and have eaten more than we probably should. So it should be no surprise that a hot dog place has made our list. If you watch the video above you will see and hear the Snap that his hot dogs have. Often this type of dog is referred to as a snapper. This is because when bitten into you hear a snap. Snappers are made with a natural casing that most of your store bought hot dogs do not have. In our opinion, natural casing hot dogs are far superior to all other hot dogs. 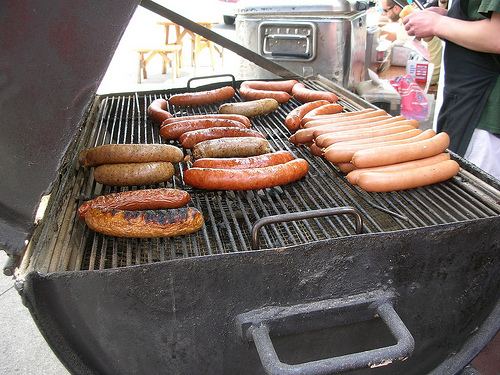 We also plan to try many of the other hand crafted sausages that Otto's has to offer. 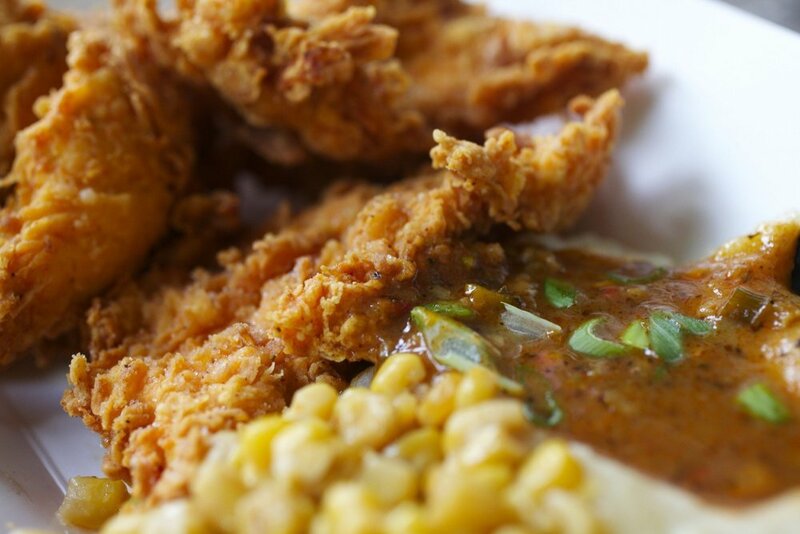 The Swamp Shack provides the type of classic dishes you will find in New Orleans. We saw this place on an episode of Eat St on the Cooking Channel. The Swamp Shack has the type of decor that looks like you are in New Orleans order food in the bayou. After visiting New Orleans last year, we know the feeling of craving some homemade Jambalaya or a Po Boys. The video above shows owner Trey Corkern making Swamp Shack's "Shack Bomb" which is a combination of sausage, chicken thighs, garlic, basil, oregano, and peeled crawfish tails. While this looks delicious that is not what hooked us. On Eat St we saw Trey making a Gator Jambalaya. If there is something we don't get to eat enough of it is Gator. Living in New York makes it a bit hard to get fresh Gator. Those of you who know us however have learned that we have our own Gator supplier down in Florida. Each year we have a huge July BBQ featuring our famous Gator Bite's, which has led to our love of Gator. So when we saw a Jambalaya featuring one of our favorite meats we knew we had to visit the Shack. In doing research for this post we also stumbled onto a bit of a surprise that we can't reveal right now, but we may not have to go all the way to Portland to try it.